Salaula, is a Bemba term that means “to rummage through a pile” and for over 300 pages Karen Tranberg Hansen takes us on a journey around the world as she aims to show us the journey of clothing from the West, where it is donated, over to North America and Europe, where the clothing is sorted compressed and baled up, to complet its journey into Africa (with a focus in this case, on Zambia). We often do not realise that our donations of unwanted clothes which we give to charity, go on a journey more intense then we envision. Or to think about those involved in the process such as those who sort and sell them, those who revive them, alter them, unravels them, through to those who finally wear them. 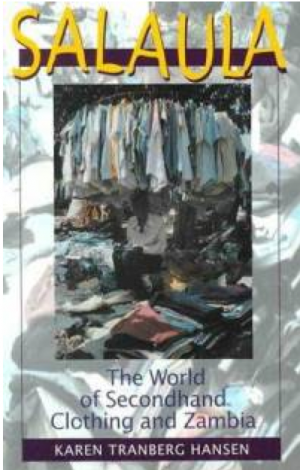 This fascinating book takes us into the world of Salaula and highlights this widely popular multibillion dollar business of secondhand clothing trade which has proved essential for the African economy. it is in this book that questions about environmentalism, charity, recycling, and thrift shopping is raised. A must read for anyone interested in the full industry of African fashion and textiles – see below for our contributing review for a more indepth journey through this book. Pietra Rivoli’s book ‘The travels of a T-shirt in the global economy’ left off with a short description of the second-hand clothing industry in Zambia. And that’s precisely where ‘Salaula’ picks up, and drills deep into the used clothing industry’s ins and outs. This book tells us the whole story of second-hand clothing by bringing two complementary aspects to the table: On the one hand, this book is a historic-scientific analysis of how the second-hand clothing trade evolved in Africa overall; and on the other it also puts us in touch with the voices, customs and judgements of those people who either trade these clothes for a living, or who buy them for their personal use in everyday life. For all cases, Hansen lays out general historic and economic context across the African continent, specifically in the centre and south of the continent, and then explains detailed specifics as they could be found in Zambia at the time of her research. One word of caution though at the beginning: This book was published in 2000, and the research spans the time period from the late 1980s to the late 1990s. As a consequence, in the 10 years since the publication of the book, and with several trade barriers if not removed then at least adjusted, the detailed situation on site will have changed, as will the trade routes, some of the principle clothing originating countries, and the type of garments widely available on the market. This said, the book is beyond doubt a unique source of information for whomever tries to understand the more complex issues of the second hand clothing trade, both economically as well as culturally. 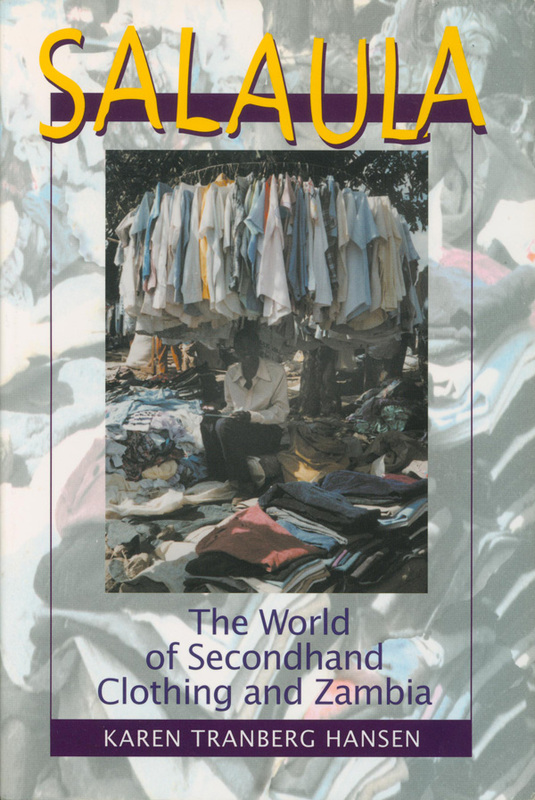 The book addresses thoroughly and from all imaginable angles the facets, aspects and interests that are at play when it comes to the second-hand rag trade. Taking Zambia as one concrete cultural and economic example, the author manages to complement and breathe life into dry academic results and statistics through the voices and experiences of real people, who are deeply involved, or affected, by the [mostly informal] economy that has built up around the second-hand clothing trade in their country. The first argument usually brought afield in relation to the shipping [read: sales] of second-hand clothing to developing countries, is that such ‘cheap’ clothing wrecks the local textile industries. It is of no surprise that also one of the principle analyses in this book is dedicated to this aspect of the rag trade. And, maybe initially counter intuitive, the facts speak for that such an assumption is not only but one half of the story, but that even this half may possibly not be factually accurate. ‘How come?’, one asks. The pivotal, and often forgotten point, in the whole argument is that for much of Africa’s population, and certainly Zambia in this specific case, the success of imported used clothing was mainly down to the reality that nationally produced cloth and garments were exaggeratedly expensive, and quality-wise not up to scratch, in first place. Few on-lookers for instance talk about the fact that specifically the rural population of many African countries, as well as the lower-income classes, were wearing rags, rather than clothes, as they simply could not afford any of the locally made products before used clothing entered the market in relevant quantities. In fact, locally produced products were inaccessible to a degree, that even in colonial times the locals would prefer getting off cast garments from their colons. 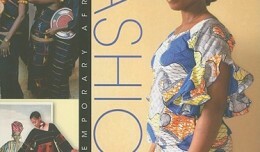 These were, after all, affordable, accessible and most importantly of good quality and hence long-wearing. And at that a far cry from the national products otherwise available to them. 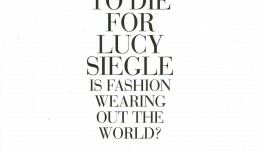 The second most frequently mentioned argument in any rag trade related discussion is that of ‘cultural imperialism’, meaning: that by ‘pushing’ people in developing countries to buy (used) western clothes, the West indirectly imposed also its cultural norms onto those nations. Again, this is but half the story. The missing part in the discussion is that traditional dresses and dress styles keep being important for festive occasions. But, imported, used Western clothes are chosen, combined, even adapted according to distinctively local, in our case Zambian, mores, styles, style preferences, and fashion sense. The one question that this book – likely intentionally – does not answer is whether or not, from a Western point of view, it is morally justified to export our cast offs to countries such as Zambia. Yet, it becomes clear that such a trade is by no means only fuelled by the West’s need to get rid of a used-clothing-overhead. But rather, that a real need for practical, stylish, affordable quality clothing in the recipient countries has contributed an equal share to the rise of the international second-hand clothing trade. ‘Salaula’ is a well written, fascinating, yet challenging read. It is originally intended for an audience of academic and industry expert, and therefore requires a substantial amount of focus and quality time while reading. The book is very detailed, accurate, well documented and references in all of its aspects. In that is possibly the only currently available comprehensive resource on the topic. This is no doubt a compulsory read for anyone interested in the larger topic of economic development in and through the textile industry.